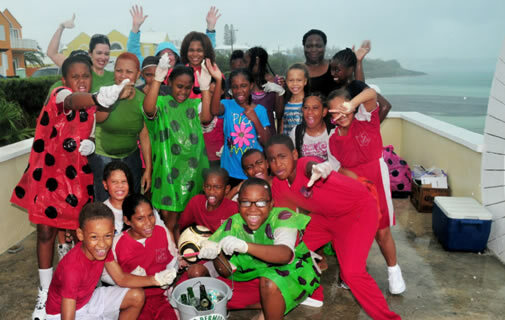 TEAMWORK: Members of the Sharks Swim Club and their families joined together in clearing Warwick Long Bay and Jobson’s Cove of trash in last year’s KBB Marine Clean-up. 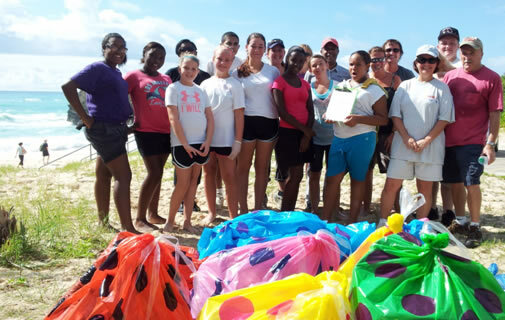 MISSION: Staff from reinsurance company Montpelier Re partnered with Francis Patton Upper Primary students to remove litter and debris from Shelly Bay beach. This year, the two groups will partner up again at Shelly Bay, where the school has pledged to clean up the beach on a regular basis as part of KBB’s Adopt-a-Spot Programme. Photos supplied. HAUL: Anne Hyde, KBB’s executive director, left, joins the Fairmont Hamilton Princess ‘Green Team’ in sorting out trash collected from Horseshoe Bay during last year’s Marine Clean-up. An army of volunteers will fight an invasion on the beaches this weekend at Keep Bermuda Beautiful’s (KBB’s) Island-wide Marine Clean-up. The annual event targets trash dumped on Bermuda’s shores, either washed up by the ocean or littered by careless residents. Last year the event attracted 380 volunteers who targeted 33 sites, amassing seven tons of garbage. KBB holds its Marine Clean-up on the third Saturday of September every year, hurricanes and tropical storms permitting. Families, friends, individuals, schools, businesses, recreational divers, community and environmental groups all join together in a bid to ‘keep Bermuda beautiful’. Last year the US Consulate General staff and a group from Royal Caribbean International’s MS Explorer of the Seas — including the cruise ship captain — also turned out to help. KBB holds its annual event to coincide with Ocean Conservancy’s International Coastal Clean-up. This is the world’s largest volunteer effort to clean up the ocean and waterways. 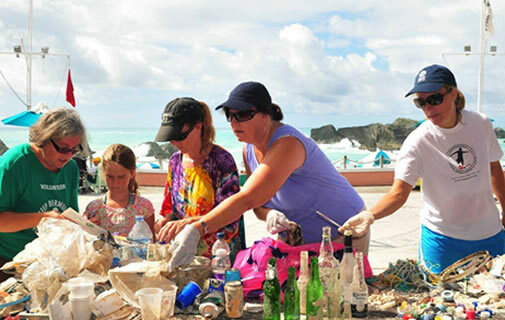 In Bermuda, volunteers comb our beaches, parks and shorelines, while snorkelers and divers retrieve underwater trash and debris submerged in our bays and inlets. Participants are also encouraged to be ‘citizen scientists’, by not only picking up litter but categorizing it and tallying each piece on a data collection card. The information is then collated on to a Site Card and sent to Ocean Conservancy’s headquarters in Washington, D.C.
Last year, the environmental organization reported 10 million pounds of trash and debris was collected by 561,000 volunteers, along nearly 18,000 miles of shoreline around the world. Getting involved in the KBB Island-wide Marine Clean-up is simple — gather a team together from your friends, family, neighbourhood, work colleagues or club/organization, choose a location and call KBB for trash bags, recycling bags, bottled water and disposable gloves. KBB can also assign you a clean-up spot, and any students taking part will receive credit for Community Service hours. According to Anne Hyde, KBB’s executive director, the number of islanders taking part in environmental clean-ups is increasing, as people become more environmentally-aware. Ms Hyde said: “It’s very encouraging to see so many diverse groups wanting to participate in KBB’s annual Marine Clean-up event. “Residents of Bermuda are becoming more aware of the problem of marine debris on our beaches from our own bad littering habits and from trash floating at sea, that gets left on Bermuda’s shores at every high tide, but particularly during a storm surge. “We are happy to have volunteers willing to pick up what’s out there, but also pleased that people are getting the message not to litter in the first place and to dispose of their trash properly. Ms Hyde said: “When you join KBB’s Marine Clean-up you will be part of a global effort. “Volunteers from more than 150 countries will be spending the morning picking up trash from the ocean and shoreline for Ocean Conservancy’s annual International Coastal Cleanup. Ocean Conservancy argues that trash in the water “compromises the health of humans, wildlife and the livelihoods that depend on a healthy ocean”. It also “threatens tourism and creations, and the critical dollars they add to our local economies”. As well as the annual Marine Clean-up, KBB also organizes an Annual Spring Clean-up, a land-based event held in May. This year’s haul resulted in 6.3 tons of trash retrieved from 35 locations. The number of volunteers also increased from the previous year — 916 people turned up to help, compared with 325 in 2012. Most of them were students. KBB clean-up sponsors in the past have included Garnier (L’Oreal) (donating T-shirts and trash bags), John Barritt & Son Ltd (providing bottled water), and Butterfield & Vallis, (donating snacks and recycling bags). Staff from the Government departments of Waste Management and Parks team up with the City of Hamilton, Corporation of St George’s, and WEDCo in the west end to coordinate the trash collection and pick-up. Volunteers place the trash into separate piles so that the correct type of waste can be trucked to the appropriate disposal site: regular bagged burnable waste to the Tynes Bay incinerator; blue bagged TAG (tin, aluminium, glass) recyclables to the Materials Recovery Facility at the Government Quarry; non-burnable bulky and construction waste to the Airport Waste Management Facility; burnable bulky items such as lumber and large plastic barrels to Tynes Bay; and any hazardous waste to the Special Waste Facility at Dockyard. The charity also runs clean-ups throughout the year. There are monthly clean-ups in various neighbourhoods, ‘trashathons’, plus school and corporate events. Last year, KBB also relaunched its Adopt-a-Spot Programme (formerly the Rockwatchers Programme). More than 60 groups have joined the scheme, ‘adopting’ beaches, parks, public docks, stretches of roads and parts of the Railway Trail. These groups of families, neighbours, students, sports teams, businesses, and civic, religious, fraternal and other organizations, make a commitment to keep their area litter-free, by engaging in regular clean-ups. The scheme aims to encourage civic pride in Bermuda’s natural beauty. KBB’s Island-wide Marine Clean-up takes place this Saturday, September 21, from 9am-12noon.